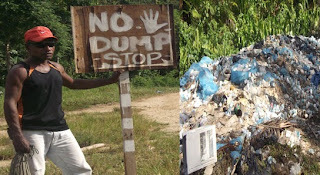 Port Moresby (The National): THE traditional landowners of Lombrum in Manus have shut down the rubbish dump used by workers at the asylum-seekers centre. John Lou, the chairman of the landowner group, said they decided to close the dump because it was a health hazard to the villagers. “Unless they pay us for the use of our land and improve the dump management, we will not re-open the dump,” Lou said. The landowners have given the asylum seekers centre management 72 hours (from last Friday) to respond to a list of demands they had been given. Copies of the demand were also given to the provincial police commander, the Lombrum naval base commanding officer and the provincial government. “They must also pay for the floating hotel they have in our sea,” Lou said. He was referring to an Australian navy ship with accommodation facilities anchored near the Lombrum naval base. Locals alleged that workers at the asylum seekers centre lived on the ship and came to work daily. Lou said the rubbish was producing a bad smell and attracted blow flies to Lombrum and surrounding villages in the Los Negros LLG. “Already some of the villagers have contracted diarrhoea, a sickness we never experienced in the past,” Lou said. “The dump has been in operation for the past 100 months and the ship has been anchored there for a month. Lou said the governments of PNG and Australia should have listened to the landowners in resolving land issues surrounding the asylum seekers centre. “If our demands are not met and negotiations fail, we will close the gates,” Lou said. He said youths at the village were talking to the barracks commanding officer about the proposed move.